A couple Christmases ago I put the Dr. Sears Nibble Tray by Zak on my Amazon wish list. My daughter wasn’t old enough for it yet at that time, but I liked the idea of it for the future. I did receive it as a gift and stored it away until she would be old enough to use it. But, honestly, I kind of forgot about it. I finally got around to using this for my now 2 year old daughter. And it’s so fun! She loves it and I have a blast filling it up. She calls it her “special plate”. The idea behind the Nibble Tray concept from the Dr. Sears website: “…put bite-size portions of colorful and nutritious foods in each section.” So, this little “nibble tray” has little compartments so you can do just that. It’s shaped like a pineapple so it’s cute and fun for kids and, if you’re having trouble figuring out what to put in it, each little compartment has a picture of suggestions for each section. The top part of the pineapple-shaped container detaches and you can put it in the freezer to keep dips cold. Each section also has a transparent lid so you can easily store leftovers for next snack time in the fridge or take it out and about with you. It is plastic, but it makes me feel better that it is BPA free. Of course, many people use this same concept with muffin tins. The nibble tray just makes it easier and cuter and has smaller little sections than a muffin tray has. I definitely like and would recommend this product if you don’t mind buying plastic. 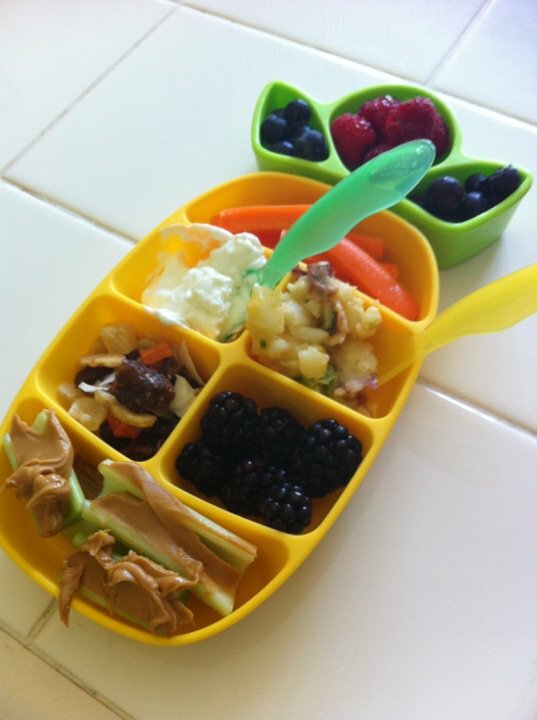 Do you do muffin tin or nibble tray meals/snacks for your kids? What are some of your favorite things to put in them? One Response to "Dr. Sears Nibble Tray by Zak: Product Review"